There was a bit of a tangy aroma in the CBC Victoria studio this afternoon as I presented a Mason jar of my homemade sauerkraut to All Points West host Jo-Ann Roberts. I made it from scratch with just five ingredients. Cabbage. Ginger. Garlic. Carrots. And salt. Squish them all together and wait a week or so and you get sauerkraut. If you remember back in April of this year I introduced you to Melanie Furman on Salt Spring Island and her Culturalive sauerkrauts and kimchis. Since I started eating her products I’ve taken a greater interest in these products, so when I got an invitation from Bootleg Betty to go to a sauerkraut making workshop in Duncan a couple of weeks ago of course I said yes. Bootleg Betty is really Holly Howe. Her husband came up the Bootleg Betty name since Holly teaches people how to make a fermented product, and the reference to bootlegging goes back to when making your own fermented alcohols like wine and beer was strictly illegal. She started eating sauerkraut for its healthy properties but became inspired to make her own after reading the book another recent Food Matters guest wrote. That would be Sally Fallon and her Nourishing Traditions cookbook. For the past ten years she’s been teaching these workshops to people who want to make their own kraut whether it’s because they want to save money or because they want to use the ingredients they prefer, as you can put many different kinds of vegetables and even some fruits into a sauerkraut. There were about half a dozen of us at a community kitchen in Duncan. Holly starts off with a bit of a lecture introducing us to the whole concept of fermented foods, which includes more than wine, beer and sauerkraut. Cider, mead, cheese, yogurt, sour cream, and cultured butter are all fermented foods, as are breads, the yeast in bread produces a fermentation, soy sauce and miso paste, vanilla and other bean products like coffee and chocolate are also fermented as part of their processing. We also tasted five different kinds of sauerkraut Holly had already made so we could figure out which one we would like to make when it came time to start chopping and shredding. They were all good so I had a hard time choosing. Ultimately I chose cabbage and ginger and carrots, but there was also cabbage and dill. Cabbage and carrots. Cabbage and beets and garlic and caraway seeds. And for kimchi, cabbage, carrots, green onion, ginger, garlic, radish and hot pepper flakes. And salt, it’s the salt that starts everything going. After you measure out the ingredients needed for your recipe into a big bowl, you add a tablespoon of non-iodized salt, and start mixing it together with your hands. Pretty soon the salt starts getting the veggies to release their liquids, and that’s when you’re ready to stuff a pound and a half of cabbage into a one-quart size Mason jar. You would never think it would fit, but it does. Holly showed us how to make sure the cabbage will stay under all the brine that’s produced and then you put on a plastic lid, and that’s it. You’ve spent a few minutes chopping your garlic and ginger and grating the carrots and shredding the garlic. But then you just wait. You put the jar in a shallow bowl and leave it at room temperature. More and more brine will be produced, and some of it will even seep out of the jar, which is why you put it into a little bowl. It kind of sings to you, strange little gurgling noises. It’s ready to eat in about a week, but to get the full benefits of the good bacteria being produced in the jar you want to let it ferment for up to four weeks before you put it in the fridge. I made my jar on October 26th and by today, November 6th, it tasted great. I’ll soon be ready to make another jar! If you really get hooked on kraut, you can purchase a special fermenting crock that will allow you to do up to five pounds at a time. Holly has two more workshops scheduled before Christmas, and if you’re further up island, the great people at Stir Cooking School in Lantzville near Nanaimo are doing a kimchi workshop in early January. Yes, people are already making plans for the New Year! Bonus post this week! I came back from Ottawa a couple of weeks ago with some delicious Quebec-made nougat, soft and chewy, with nuts and a bit of fruit. As I chewed, i started wondering if I can make nougat using my Thermomix? A little bit of searching on the intertubes and I had my answer: YES!! That’s it. Put the egg white in the Thermie, whiz at speed 2 for 10 seconds. Put on the butterfly. Add the honey and the orange water if using. One hour, temperature 100, speed 2. Trust me. The mixture will get thicker and thicker, but it shouldn’t seize. Here’s a video of what it looks like when it’s about halfway through. Out of the Thermie, onto the silicon mat. When the hour is up, stir in by hand the nuts. Then scrape all the nougat out of the canister and onto parchment paper, or preferably a silicon baking mat. Smooth it out with a spatula and top with another piece of parchment paper or another mat. You can now actually roll it out a bit with a rolling pin if you like to make sure it is of uniform smoothness. Let it rest overnight. The next day take it off the paper or silicon mat and place on a cutting board you have generously dusted with icing sugar. Dust the top of the nougat and slice into desired shape and size of pieces. You’re done. Yes, you can taste a couple to make sure they’re okay. Oh, and a handy tip I picked up from one of the websites I visited: When you’ve scraped out the Thermomix bowl, add a few drops of dish soap, fill it 3/4 full of warm water, and put on 1 minute, Varoma, speed 6. 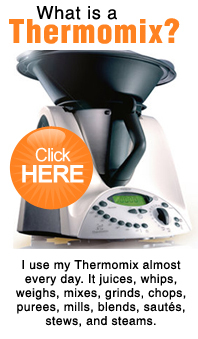 Another amazing demonstration of what the Thermomix is capable of doing. Contact me if you’re interested in getting one! Allspice, cinnamon, cilantro, and dill. Fairly common herbs and spices in Canadian kitchens these days. But what about asafoetida, fenugreek and galangal? Those are also herbs and spices you may see popping up in your list of ingredients in cookbooks these days. If you’re not familiar with some of these names, I’ve been poring over just the book to help you out. The Spice and Herb Bible is quite a weighty tome. The author of this guide to everything you need to know about herbs and spices is Ian Hemphill. He lives in Sydney, Australia, where he runs a shop called Herbie’s Spices. I had heard of this shop before when I was visiting Australia years ago, and when I found out he was going to be in Vancouver at the same time I was, I really wanted to meet him. We met at one of the big spice and grocery shops in Vancouver’s Punjabi Market, which really got him going with all the different goods on display there. The book is his way of getting his knowledge out around the world. The Spice and Herb Bible had just arrived at my house when my nephew was visiting, who is just getting into cooking, and he picked it up and couldn’t put it down until I had to grab it from him and then I was captivated going from one topic to the other, because it is filled with so much fascinating history and information. Ian’s daughter Kate is a chef, and she provides lots of recipes throughout the book to give you examples of how to use many of the spices found within its pages. Ian loved the spice shop we were in. We were only there for about half an hour, but I could easily have spent the whole day with him, moving our way down the racks and bins of spices, as he had something fascinating to say about practically everything. Here is our conversation, presented as an mp3 file for your listening pleasure. News reports of late have warned us to expect the cost of our fresh produce to rise because of drought conditions in California. Welfare advocates warn that benefits recipients simply don’t have enough money to buy healthy food. And at the same time the amount of food we waste around the world is at an all time high. I touched on all of these topics this week on Food Matters. These are all definitely matters of concern, but when you put them together it starts to sound like the perfect storm… I can’t have a full discussion of prices, poverty and waste in one blog post. But I do like to get you to at least start thinking about these issues and provide a few directions for further study if you’re interested. It’s not the first time we’ve heard of drought in California having an effect on our fresh fruit and produce prices, but part of what’s different this time around is the length of the drought, and the fact that the growers haven’t been able to easily bounce back from one dry season. It’s been basically 30 months of drought now, and prices just have nowhere to go but up given the old supply and demand scenario. What I find the most disturbing part of this, though, was contained in a report released earlier this month that was commissioned by VanCity. The data from 2010 showed we rely on the United States for 67 percent of our fresh produce imported to BC, and half of that is from California. At the same time, vegetable crop production in BC has fallen by 20 percent between 1991 and 2011, and just between July 2013 and July of this year, have gone up between 6 and 10 percent. I really don’t know why production of our own fruits and vegetables hasn’t gone up instead of down. I know you can look at certain sectors, probably grapes, blueberries, cherries and cranberries, where there is a bit of a boom going on, but these are wine grapes and a lot of the other fruits get exported. You would think the answer to combat rising prices of imported goods would be to grow more of them here, right? I guess that’s the simple answer, but I’m not an economist. But I also think there’s something wrong when our governments spend money promoting exports of our products when we can’t even feed ourselves. While our food prices continue to rise, people who are living at or below the poverty line will find it increasingly difficult to put healthy food on the table. We all know it’s cheaper to buy 2 litres of soda than it is to buy 2 litres of milk. Junk food costs less to buy than healthy food…and junk food generally has high levels of fat, sugar and salt, which plays right into rising rates of obesity, heart disease and type two diabetes. Vancouver-based singer Bif Naked has been drawing a lot of attention this week while she is taking the Welfare Challenge this week, trying to live on just 21 dollars to spend on food. Her Facebook page is loaded with literally hundreds of comments, some negative, mostly positive on her effort to get governments to raise welfare rates. Here’s what she bought, and keep in mind she sticks to a vegan diet: brown rice, 2 cans of chickpeas, 2 heads of (non-organic) iceberg lettuce, a pint of cherry tomatoes, six zucchinis, six bananas, and a bag of (non-organic) spinach. In a photo of what she would like to buy, papaya and handfuls of organic spinach, organic cucumber, 4 organic zucchinis, 4 organic bananas, vegan protein powder, hempseeds, pea shoots, almonds, 2 organic Roma tomatoes, and an organic avocado: $45.00. As I’ve scrolled through the comments, many people have noted that there is a real lack of education on how to shop and cook and feed ourselves in a healthy manner. I’m not very surprised at that given how so much of our industrial food system is targeted at producing convenience foods that basically take all of the knowledge of what goes into making food out of our hands. I think I could be quite creative at stretching a dollar but I have been cooking for decades, learned from a mother who pinched pennies and have a big arsenal of cookbooks to refer to. The waste of perfectly good food is the last scary issue on my agenda today, and again we’ve talked about this before. Crops that never get harvested because they might be blemished or overripe or just aren’t the right size or colour for demanding shoppers. The number of people that could be fed if we could just get over that demand for perfection is staggering. Please mark Wednesday, November 19th on your calendar if you are anywhere near Victoria, Sidney or Salt Spring Island where the documentary Just Eat It, A Food Waste Story will be playing that evening, complete with discussion afterwards. This documentary was made by a Vancouver couple, Grant Baldwin and Jenny Rustemeyer and created a stir of good reviews at the Vancouver International Film Festival. Get this: The duo lived on food they mostly retrieved from dumpsters for six months, they spent only 200 dollars on food during that time. The film covers their adventures doing that, but also features interviews with food scientists and activists trying to make a difference. I’m really looking forward to seeing this, as the reviews I read really praise it from a number of angles, including the cinematography that, for example, features Baldwin standing in a huge garbage bin described as ‘swimming pool sized’, filled with sealed plastic packs of hummus that are still one month before their best before date. It’s a rather plain looking cookbook. No photos, plain line drawings and some vaguely cryptic colour sketches on the cover depicting various ethnicities and food production. The subtitle on the book Nourishing Traditions, however, does attract attention: The Cookbook That Challenges Politically Correct Nutrition and the Diet Dictocrats. And it attracted my attention. This book was first quietly published in 1999 but has continued to find a place on bookstore shelves since then. 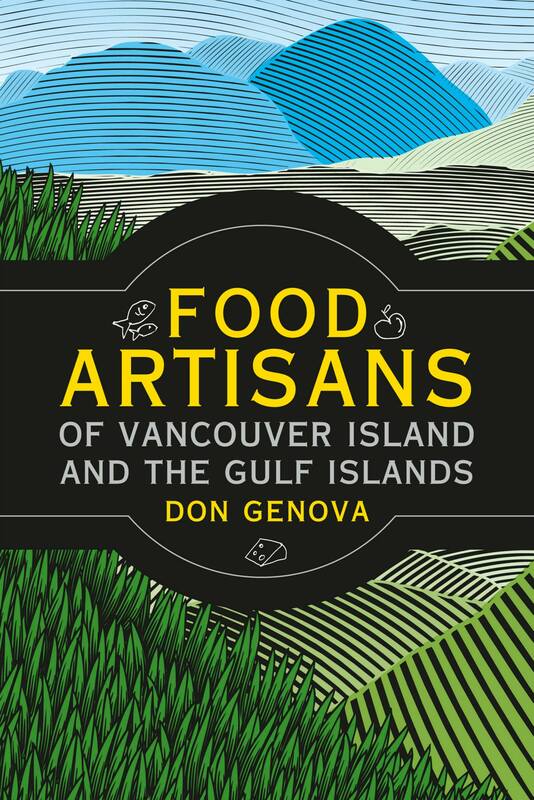 It’s part cookbook, and part dietary information and advice that as the subtitle says, sometimes challenges many preconceived notions about how we now cook and eat our food. But the challenges are all about concepts that are kind of coming back in vogue now, concepts like eating more butter, whole raw milk, organ meats, bone broth and cod liver oil. The main author is Sally Fallon, the president of the Weston A. Price Foundation. Sally traveled to Victoria last week from San Francisco to give some lectures at Pacific Rim College and was able to spend a few minutes with me before she got started. Weston A. Price was an American dentist, born 1870, died 1948, but is known less for his ability to filling cavities and more for his theories on the relationship between nutrition, dental health, and physical health. He formed his theories by studying so-called traditional peoples around the world. While he looked at different ethnicities of people in different countries, they may have been healthy but they wouldn’t have eaten all the same foods. So he started to look at some of the underlying principles of their diets to see if there were some commonalities. Based on that research Sally says he came up with three different diets, one was no refined or denatured foods, no modern foods, two, all the cultures he studied ate animal foods, there were no vegan cultures, and they placed a large emphasis on those foods, but the third diet, and most important in her mind, involves the principle of nutrient density. No matter where they were living, they were eating foods with far more nutrients than we get in our diets today. And that’s partly because of what they chose to eat and how they prepared the foods for themselves. For example, Sally says, they ate the organ meats and fats first, because they had much more food value. The prime ribs and steaks? She says they threw them out. Eat the liver and throw away the steak is definitely a different take on what many nutritionists might recommend today. And other researchers who have looked into Price’s research say either he was misguided, or his recommendations have been misinterpreted over the years. The Nourishing Traditions cookbook is also big on advocating the consumption of raw milk, which has caused the Weston A Price Foundation to come under some fire from the US Food and Drug Administration, and of course here in Canada the debate about the benefits and the risks of consuming unpasteurized milk rages on. However, none of the controversy the Foundation raises daunts Sally Fallon in the least and she has just published another cookbook called Nourishing Broths, which will probably prove to be less controversial as who doesn’t love a good bowl of soup! But we’re not talking pure vegetable soup here, the broths are made from things like chicken and beef bones. And so, in the interests of science and health, I made two soups for Jo-Ann Roberts to try today made from a broth recipe in the Nourishing Traditions cookbook. So I made the broth, and then my wife Ramona, who is a much better soupmaker than I am, did her magic and changed some of the broth into a chicken and coconut soup, and more of the broth in to the pork and shrimp wonton soup. Last week there was quite a bit of news about the problems a company from Seattle was having with the Canadian Food Inspection Agency. Field Roast Grain Meat Company doesn’t have approval to sell its products in Canada because it hasn’t met labelling and test regulations for a meat substitute product. The company manufactures vegetarian sausages, burgers and roasts, among other products. The whole discussion over these meat substitutes got me thinking about ways to go vegetarian without having to rely on these so-called ‘meat substitutes’. I have tried these meats substitutes in the past. Not from this particular company that’s been in the news, but over the years I’ve tried many products all the way from Yves Veggie Cuisine burgers and dogs to the Schneider’s Au Naturel line of chicken nuggets and so on. Yes, that Schneider’s. Some were better than others, I actually wrote a story for BC Business magazine on how Yves was developing a veggie burger for McDonald’s and it was all about getting the right mouth feel and how it chews and making it as much like a regular burger as possible. Companies develop these products, in part at least, so that people who want to eat fewer meat products have something that still resembles a food that they’re used to. But these meat substitutes are usually made of highly processed ingredients and I figure, why not just use all the great ingredients we have right here around us to make something really tasty that doesn’t have to have meat in it. To that end I have a couple of great suggestions that can be both vegetarian and vegan, and gluten free! First there is this grilled Portobello mushroom recipe from the Cooking on the Weekend blog. One neat thing I learned about grilling portobellos is that you should scrape off the gills from the mushrooms before you marinate and grill them. Apparently the gills can get quite bitter when you grill them. The recipe advises you to keep the marinade and use it to drizzle over the mushrooms after you’ve grilled and sliced them. But I took the marinade, heated it in a small pot and added a big tablespoon full of brown miso to stretch it out a bit and add extra flavour. Perfect! The other recipe is from local Victoria chef Heidi Fink. I asked her for this recipe when I was preparing a magazine article about roasting, but it didn’t end up getting used, which is a shame because it is such a great recipe! You’ll find the recipe in full at the end of this post. The Portobello mushroom dish is vegan and gluten free depending on the kind of soy sauce you use, make sure it’s not one made with wheat, and the acorn squash dish is gluten free and vegetarian, it can be made vegan simply by using a vegetable oil instead of butter to roast the squash and sauté the vegetables for the pilaf. I have to admit I am a confirmed omnivore and there will be a free-range turkey on my Thanksgiving table, but I wouldn’t hesitate to serve these two dishes as main courses on any other day of the year. If you still need advice on how to do some real roasting, I have the cover story on this fall’s edition of Flavour magazine, which you can find at most private liquor stores in BC, but here’s a link to that as well. For confirmed meat eaters, you might want to try Stein and Dine at the Victoria Public Market on Friday night, that’s a real Oktoberfest celebration with plenty of dishes like Grilled Bratwurst, Rotisserie Chicken, Crispy Pork Rinds and Pork Knuckles, along with beers from some of the region’s best brewers. But if you want more vegetarian dishes I will be offering up some at a free Thermomix cooking demo at the Victoria Market on Saturday at noon, which will include homemade Nutella…did you know that there might be a big increase coming in the price of Nutella because of a hazelnut shortage? And if you just want to explore the world of cocktails you can catch up with me at the Grand Tasting at Art of the Cocktail Saturday night at the Crystal Gardens and I’m emceeing the Art of the Cocktail Bar Games event on Sunday night. I will need to take a big rest on Monday morning. Surprise your guests with a decorative centrepiece – a whole French pumpkin – which opens to reveal a fragrant filling of delicious herb-studded quinoa pilaf. This full-flavoured pilaf can be served either as a side dish, or as a vegetarian main. Bake in mini-squashes for individual servings, or larger squashes for sharing. Squash and pilaf can be prepared and refrigerated up to two days in advance. Add 10 to 15 minutes to the baking time to make up for the chill of the refrigerator. 2. If using small squash, cut a small slice off the bottoms (without going into the cavity) so the squash will sit flat, then cut off the tops and scoop out the seeds and membranes. If using medium-sized squash, cut in half through the stem end and scoop out the seed and membranes. If using a large squash, cut off the top and scoop out the seed and membranes (usually these squash will sit flat of their own accord). 3. Every type of squash, once trimmed and cleaned, will need to be brushed generously with melted butter and sprinkled with salt. Place prepared squash, cut side up, on a baking sheet and roast in the oven until three-quarters cooked (tender while still holding its shape), about 20 to 25 minutes for small, 30 to 35 minutes for medium, and 45 for large squash. Once cool enough to touch, transfer squash to oven-proof serving dish, if desired. 1. Heat butter or oil in a 2 or 3-litre saucepan over medium-high heat. Add onion and sauté until translucent and soft, 7 minutes. Add garlic, thyme and sage and sauté until fragrant, about 30 seconds. Add the well-rinsed and drained quinoa and stir to coat with oil. Add the broth, the chopped dried apricots, the salt and the pepper. Bring to a boil, stir briefly to redistribute the heat, cover, reduce heat to lowest setting and simmer for 20 minutes without disturbing. Remove from heat and let stand, covered, for 10 minutes. (This last step allows the quinoa to firm up so it will not be mushy when the final ingredients are stirred in). 2. Meanwhile, place pecans on a rimmed baking sheet. Place in the oven and roast, stirring once in the middle of roasting, for 6 to 8 minutes, until fragrant and a few shades darker. Remove from oven and let cool. Chop pecans roughly and set aside. 3. After the quinoa has rested 10 minutes, remove cover and gently stir the pecans, parsley, and peas into the quinoa. 4. Gently pile the quinoa pilaf into the prepared squash, which are ready in an oven-proof baking dish, return to the oven and bake 10 to 20 minutes (depending on size of squash) until hot through, squash has finished cooking and top of pilaf is nice and crispy.